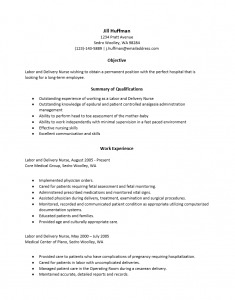 The Labor and Delivery Nurse Resume Template offers a method by which a job seeker may organize the content of his or her resume. In addition, it will offer a sleek no-nonsense professionally attractive resume by having a clearly visible structure. This is particularly important as today’s market will require that a resume stand out aesthetically in a hiring entity’s collection of inquiries in order to have a fair amount of attention paid to the content. The look, feel, and content of a resume will be an applicant’s first impression upon a recruiter. While it will accompany other paperwork (i.e. cover letter, application etc. ), this document will be a driving force in the decision making process of whether to call in an applicant for an interview. 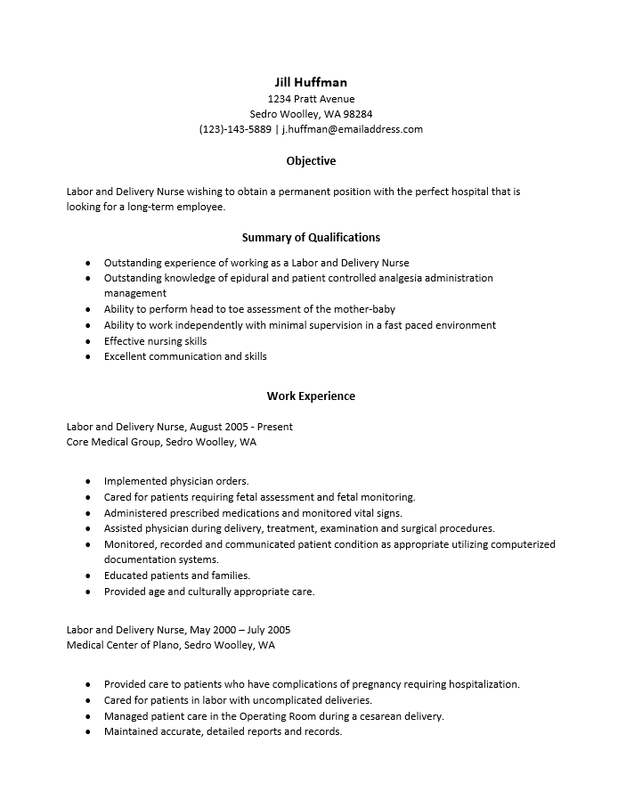 The content should demonstrate one’s knowledge of all aspects of a labor and delivery nurse’s responsibilities which range from the delivery of a newborn to the general operating procedures of the department itself. This can be achieved through the use of the language a nurse is required to know, employing buzzwords when appropriate, and being direct. This will show both the ability to communicate clearly and a certain consideration to a hiring entity’s time. The goal of this resume after all is to attain an interview and most topics on the resume will be addressed during this event. Users who employ a template when composing a resume will enjoy certain benefits of doing so. As mentioned earlier a template adds a framework in which to place content. This will hasten the inquiry process. That is, rather than starting from scratch every time one makes an inquiry they may simply copy and paste many of the sections containing static information from an original copy into a blank template. This allows one to aim a resume directly at a particular employer relatively quickly. Step 1. Enter your name and contact information at the top of the page. This information should be clearly visible and will act as a business card. Step 2. The “Objective” section should contain one to three statements regarding your intention of attaining the position and/or which skills you possess may be employed. These should be very brief statements. Step 3. The heading labeled “Summary of Qualifications” is a bullet list of your skill set, experience, and knowledge as they relate to the position you are applying for. Use this as a chance to shine. Step 4. The “Work Experience” section is a list of your previous professional positions. This should be in descending chronological order and should deliver the official job title, date range of employment, employer name and location, and a list of duties you were responsible for there. Step 5. Your academic credentials such as official degree title, school, and school location should go in the “Education” section.